I was watching one so or another and realized it had been a long time since I did any really serious seafood cooking. So I worked up this little ditty. It was so good! Bring a large pot of water to a boil. I always put some salt in and oil the top. Add pasta and cook until just tender (~8-10 minutes), Drain, rinse and and mix in a little olive oil before your set aside. Reserve 1 cup of pasta water. In a separate sauce pan, cover the shrimp shells with water and simmer for 15 minutes. Remove and discard shells. Set aside 1 cup of stock. Increase heat to medium high, add tomatoes, salt, pepper and wine. Bring to a simmer and cook for one minute. Add shrimp stock and clams, cover. Cook for 2 minutes. Add mussels, cover and cook for another 3-5 minutes. Stir and check to make sure all the clams and mussels have opened. 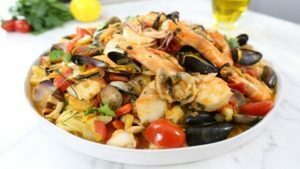 Remove clams and mussels and set aside. Discard any that have not opened. Stir in calamari, shrimp and half of the chopped parsley. Cover and cook until calamari is opaque and shrimp is pink (~2 minutes). Cooked too long they will get tough. Stir in heavy cream and return clams and mussels to the dutch oven. Mix it all together and let the sauce comes to a simmer. Add pasta water if needed and as needed to get the sauce the right consistency. Add in cooked pasta and allow the dish to reheat while mixing it all together. Add most of the parmesan cheese and the rest of the parsley. Garnish with fresh grated parmesan and parsley.